Location: Block 53/6, Southern Porcupine Basin, c. 220 km off the southwest coast of Ireland. 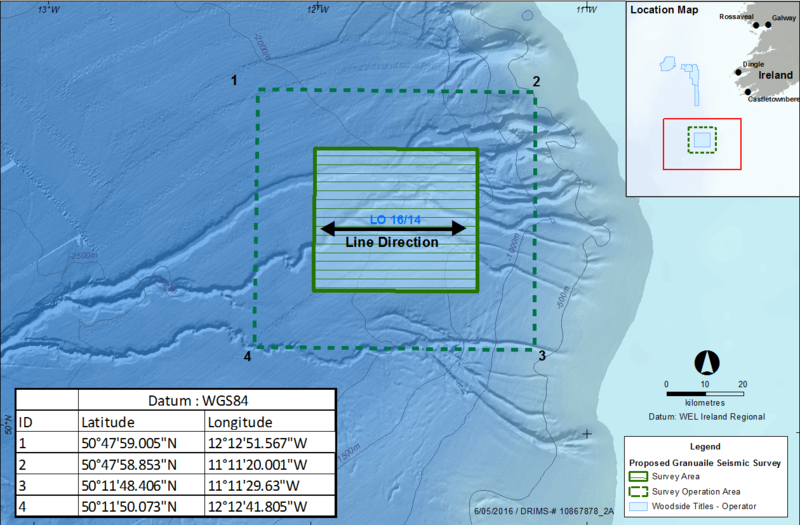 The site survey will be undertaken using dual frequency side scan sonar, single-beam and multi-beam echosounders, side scan sonar, sub-bottom profiles and magnetometer. Seabed (benthic) samples will also be taken using a box corer or grab, as appropriate, and geotechnical sampling will be undertaken with a piston corer to a minimum target depth of 6m below the seabed. 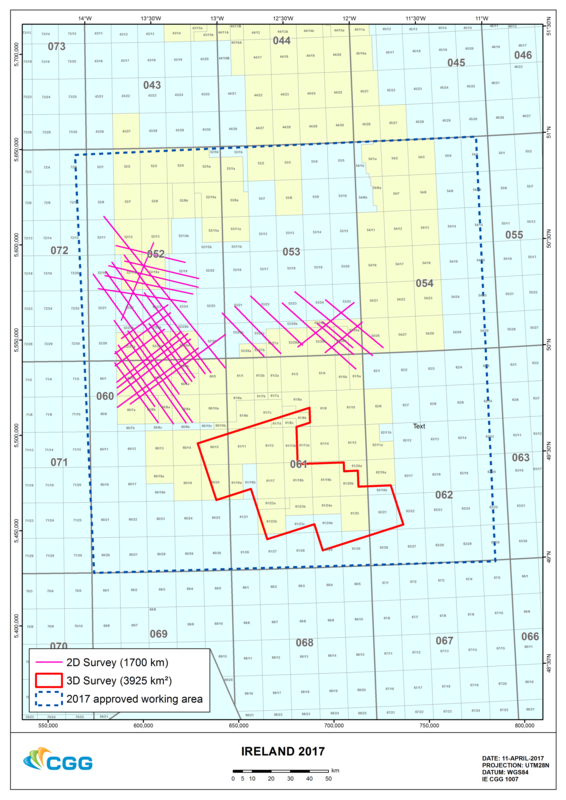 The proposed survey will also include high-resolution 2D seismic acquisition to accurately determine potential future drilling hazards over the Newgrange location. The vessel will tow 12 x 8100m long solid streamers, with a separation of 100m and at depth of 18m below the surface of the water. There will be a surface tailbuoy, including a flashing light and active radar transponder, at the end of both of the outer streamers. The seismic vessel and equipment will traverse along pre-determined lines across the operations area at a speed of approximately 4.5 knots. The entire footprint of the vessel, including a 500m safety zone, around vessel and all equipment, is 9100m long by 2,000m wide. 44/13-14, 44/17-19, 44/22-25, 44/28-30, 45/26, 53/3-5. The vessel will tow 12 x 8000m long solid streamers, with a separation of 100m and at depth of 12m below the surface of the water. There will be a surface tailbuoy, including a flashing light and active radar transponder, at the end of both of the outer streamers. The seismic vessel and equipment will traverse along pre-determined lines across the operations area at a speed of approximately 4.5kts. 52/11-13, 52/16-30, 52/6, 53/21-30, 54/26, 60/1-5, 60/7a-9, 61/5, 62/1. 60/14-15, 60/20, 61/6-9, 61/11-13, 61/16-25, 61/27, 61/29-30, 62/16, 62/21-22, 62/26. The vessel will tow 14 x 8000m long solid streamers, with a separation of 100m and at depth of 12m below the surface of the water. There will be a surface tailbuoy, including a flashing light and active radar transponder, at the end of both of the outer streamers. The seismic vessel and equipment will traverse along pre-determined lines across the operations area at a speed of approximately 4.5kts. 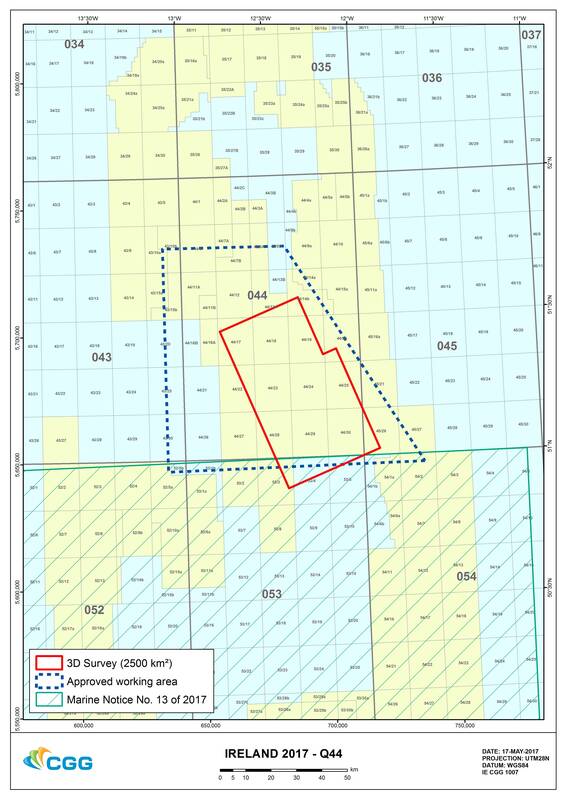 Operator: Orbis Energy Ltd on behalf of Providence Resources PLC. 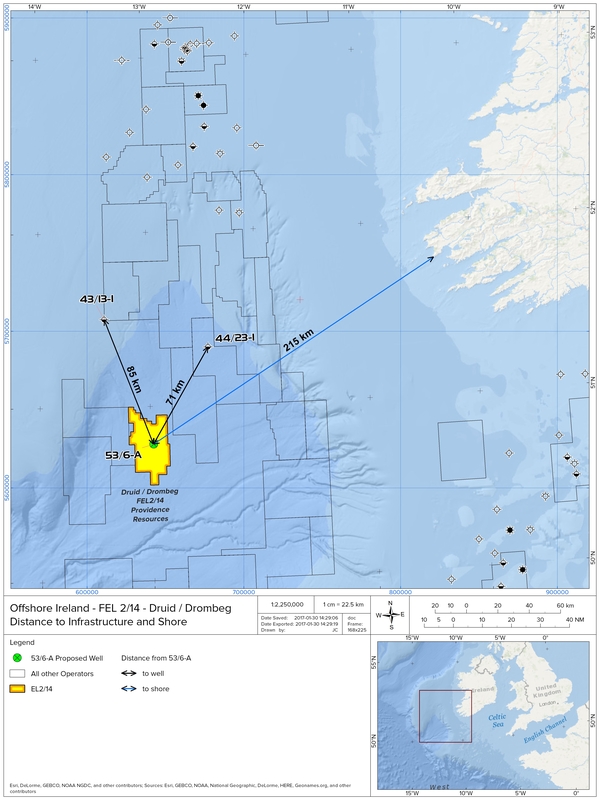 Location: Block 53/6, Southern Porcupine Basin, approximately 220 km off the southwest coast of Ireland. Activity: Multi-beam echosounder, dual frequency sidescan sonar and sub-bottom profiler assisted by the use of an Autonomous Underwater Vehicle (AUV) operated in close proximity to the vessel. 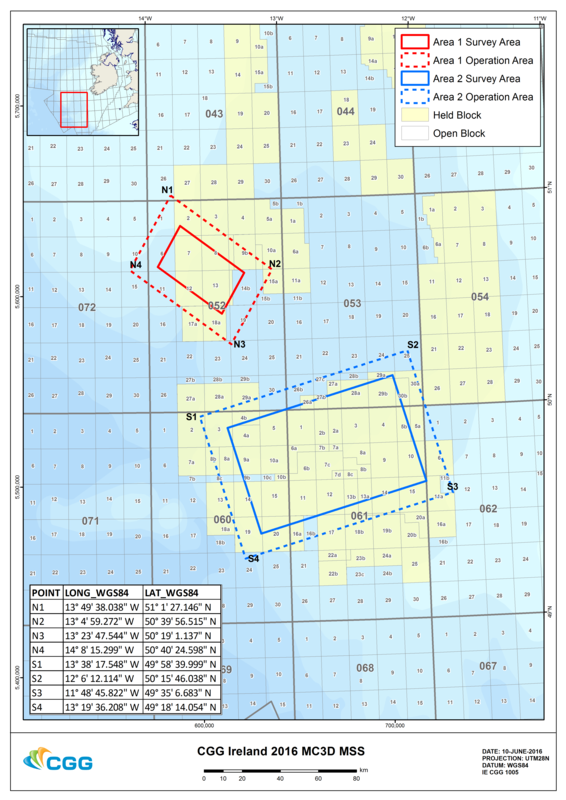 The survey will also include shallow geotechnical sampling and an Environmental Baseline Survey. Start Date and duration: 19th February 2017 and the estimated duration is 6 days, weather permitting. The latest completion date for the survey is 19th March 2017. Vessel Name/Call Sign: The Fugro Searcher (call sign: 3EUY6). The vessel will be listening on VHF Channel 16 at all times. South East Porcupine Basin, 150 kms southwest of Ireland. The vessel will tow 12 x 7050m long solid streamers, with a separation of 120m and at depth of 15m below the surface of the water. There will be a surface tailbuoy, including a flashing light and active radar transponder, at the end of both of the outer streamers. 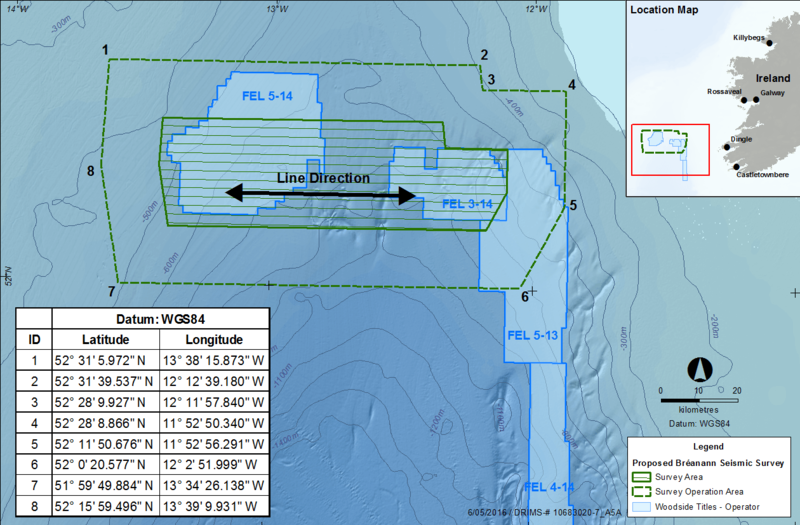 The seismic vessel and equipment will traverse along pre-determined lines in an east-west orientation across the operations area at a speed of approximately 4.5kts. The entire footprint of the vessel, including a 500m safety zone, around vessel and all equipment, is 8,150m long by 2,500m wide. 34/19(p), 34/20(p), 35/16(p), 34/24(p), 34/25(p), 35/21(p), 35/23(p), 35/24(p) and 35/25(p). North Porcupine Basin, 150kms off the West coast of Ireland. The entire footprint of the vessel, including a 500m safety zone around vessel and all equipment, is 8,150m long by 2,500m wide. The vessel will tow 14 x 8000m long solid streamers, with a separation of 75m and at depth of 12m below the surface of the water. There will be a surface tailbuoy, including a flashing light and active radar transponder, at the end of both of the outer streamers. The seismic vessel and equipment will traverse along pre-determined lines across the operations area at a speed of approximately 4.5kts.